Where Do All these Colors Come From? Are They Purebred, & Can You Register Them With AKC? 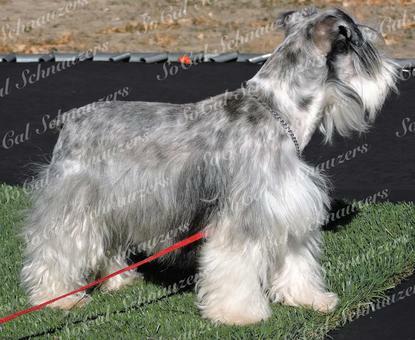 The answer is YES, AKC does recognize and register all these different colors as purebred Schnauzers. You’re welcome to contact AKC for more information at (919) 233-9767 regarding these colors and their registration color codes are. There are a lot of crazy (what I call color racist) people out there who just can't accept any color other than the three colors that are allowed in the show ring. They make up things like they are not purebred or they are fakes, and NO they are not. 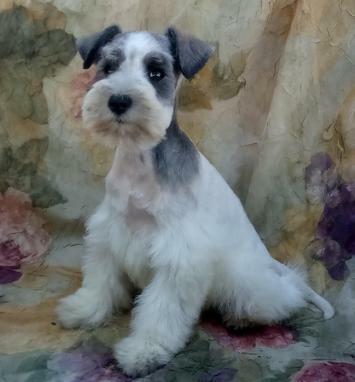 I spoke to one lady who was one of those snooty show dog people, and she told me I would have to fix my white male and sell him before she would ever sell to me. She also said back in the day when white puppies were born they would dispose of them or euthanize them!! How sad is that, all because it was not one of the three main colors the AMSCA decided to keep out of all the other colors that came into the breed from the poodles and pinchers that were bred back in 1800's? 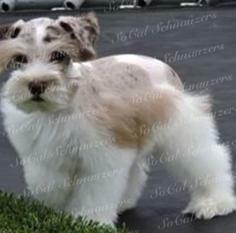 to create the mini schnauzer. It doesn't make any sense to me. I own one of just about every color they come in, and I can tell you there is no difference and they all are purebred dogs. So my advice is, make your own decisions don't let someone tell you what to do. 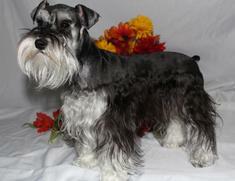 Educate yourself and learn all about the history of schnauzers. 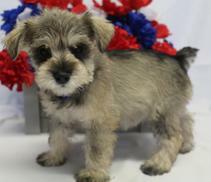 As you choose a puppy, keep in mind that a lot of schnauzers fade over time. So black & Silver could end up looking like a Salt & Pepper, Liver could end up looking like a Liver Pepper and so on. So we encourage you to do your research, this way you can be comfortable with all the colors and what to expect. Then you can have a blast picking out your favorite one! Born with solid black bodies. 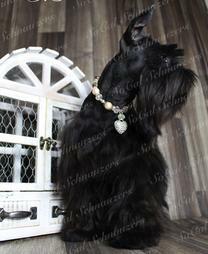 It is common for black schnauzers to have some white on their chin, chest and/or tips of their toes. They usually have brown eyes, black pads and a black nose. 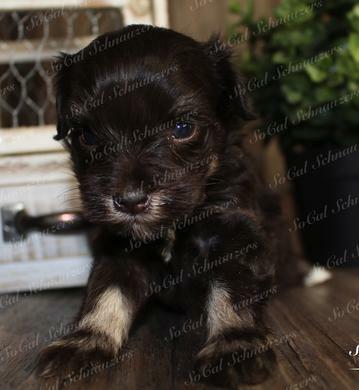 Born with black bodies and white on their eyebrows, muzzle, inside the ears, across the chest, down the legs on the feet and underneath the tail. They usually have dark brown eyes, black pads, and a black nose. Black & Rusts are born with a Black base coat and have orange or rust-colored eyebrows, beard, chest and, patch under the tail. Black & Rusts are born in many different shades of orange/rust, the darker the orange/rust, the more expensive this color is. This color is one of the rarest color schnauzers out there. 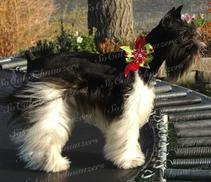 They are registered as a Black & Silver through AKC and typically have brown eyes; black pads and a black nose. Why is Phantom Used In Different Colors? What Does it Mean? Is It Also A Purebred? Phantom is just a term used to describe how bright the markings are. So a phantom Black & Silver is the same as a Black & SIlver. Only it has much more vivid markings. 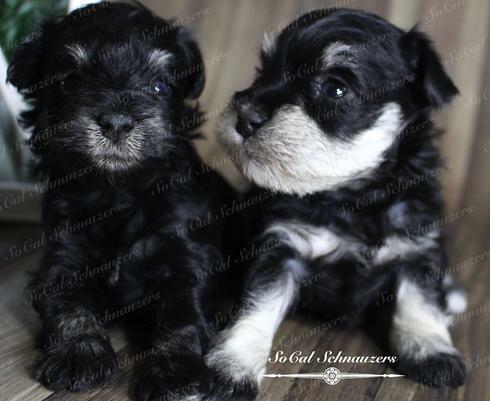 They are NOT two separate colors, and yes they are still purebred Miniature Schnauzers. We also use this term in Liver & Tans and sometimes others as well. Liver (brown) schnauzers are born with solid brown bodies. Some white on their chin, chest and/or tips of their toes are common. They usually have brown, hazel or green eyes, chocolate pads a chocolate nose. Born with solid chocolate bodies and tan, cream or white markings on their eyebrows, muzzle, inside the ears, across the chest, down the legs on the feet and underneath the tail. They usually have brown, hazel or green eyes, chocolate pads & a chocolate nose. Liver & Rust's are born with a liver base coat and have orange or rust-colored eyebrows, beard, chest and, patch under the tail. Liver & Rusts are born in many different shades of orange/rust, the darker the orange/rust, the more expensive this color is. 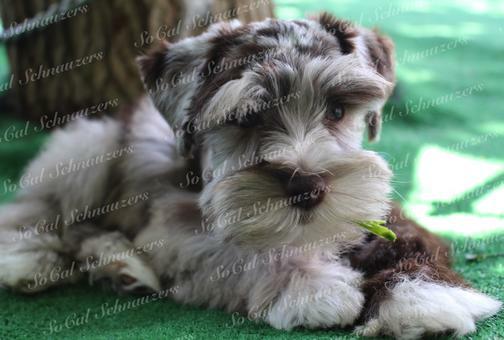 This color is one of the rarest color schnauzers out there. 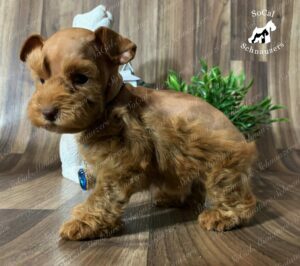 They are registered as a Liver & Tan through AKC and typically have brown, hazel OR green eyes; brown pads and a brown nose. No, they are not. Albino is a term that many people find confusing. A true albino has an absence of color throughout its entire body meaning they will have pink/red eyes, pink skin, pink pads pink eyelids & pink lips. Some think it is a synonym for white, and refer to any dogs that are white as an “albino” which is entirely incorrect. 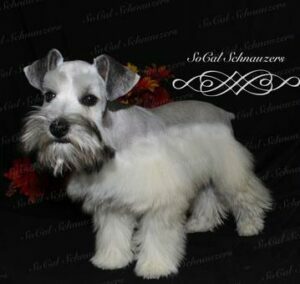 So just to be clear White Schnauzers are NOT a defect, and they are NOT albino’s. 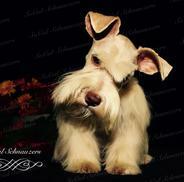 White Schnauzers are extremely popular, healthy & live long lives. The colors white, Cream and Red are created by what's called ee on the dogs e locus of the dogs genetic coat color pannel. 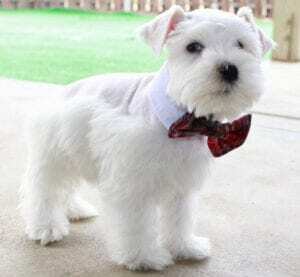 White Schnauzers are born with solid white fur. Their skin has a gray/black tint to it. They usually have brown eyes, black pads and a black nose. 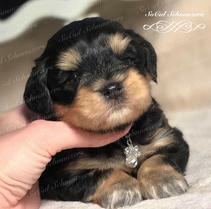 This photo is from another breeder whose I got permission to use their photo, this is not my dog. 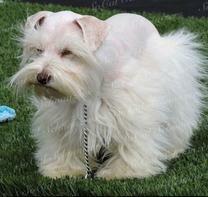 A true White Chocolate Schnauzer is born solid white. Their skin underneath their hair is usually pink. They typically have brown, hazel OR green eyes; brown pads and a brown nose. Red's are born in many different shades of orange/red, the darker the color, the more expensive this color is. 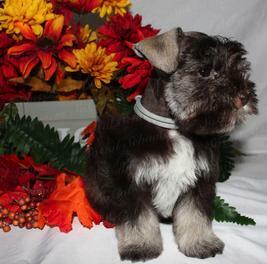 This color is one of the rarest color schnauzers out there. They are registered as a Wheaten through AKC and typically have brown, hazel OR green eyes; brown or black pads and a brown or black nose. Creams are born in many different shades. They are registered as a Wheaten through AKC and typically have brown, hazel OR green eyes; brown or black pads and a brown or black nose. 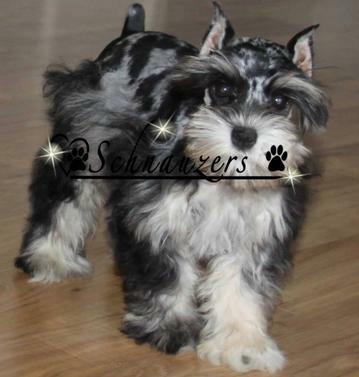 This is another rare colored schnauzer as well. 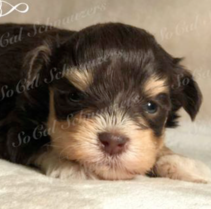 They are registered as a Salt & Pepper through AKC and typically have brown , hazel, or green eyes; brown or black pads and a brown or black nose. Sable is on the same "a" locus as salt and pepper is. Born in a variety of shades from very dark to very light. No matter how dark or light the puppy is, Salt & Peppers usually always have a tan shade on the sides of there body at birth. Salt and peppers have banded hairs of gray that almost always turn silver/gray as adults. If you aren’t familiar with “banded hairs” that just means each strain of their hair has three shades of color on it instead of only one solid color. They usually have brown eyes, black pads and, a black nose. Sorry, I don't have an example of a true platinum silver at this time. 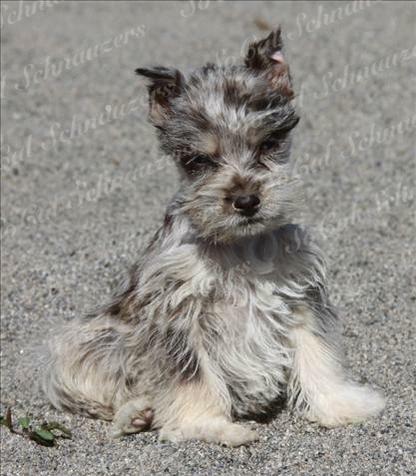 Platinum silvers are the lightest shade of salt & pepper schnauzers you can find. They are born a very light gray color and may have banded hairs that turn into an extremely light silver, and some can even appear almost white. AKC registers Platinums as Salt & Pepper. They usually have Brown eyes, black pads and, a black nose. Born in a variety of shades from very dark to very light just like the Salt & Pepper. Liver Peppers are the recessive are recessive to salt and pepper and have banded hairs of brown/chocolate that usually always fade out into a lighter brown/chocolate as adults. They usually have brown, hazel OR green eyes, brown pads and a brown nose. 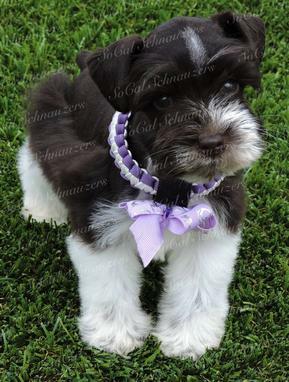 This photo is not mine I got permission from another breeder to use it as an example for tis page. Salt & Pepper Parti's possess a Salt & Pepper base coat and have patches of white all over there body which resembles a cow. Every parti has different markings; Some have there Entire back one color and the underside white, some breeders call those "Blanket Parti's." This term has nothing to do with genetics it is just a term used because it looks like someone covered there backs with a blanket. Hints the name "Blanket Parti," they are still registered as a Salt & Pepper Parti. Born in a variety of shades from very dark to very light just like the Salt & Pepper. Salt & Pepper Partis have banded hairs of gray & white on the gray patches that usually always fade out into a lighter gray as they age. They typically have brown eyes, black pads and, a black nose. 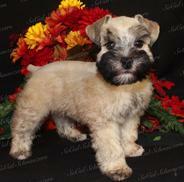 This photo is from another breeder whose I was granted permission to use. Black Parti's possess a Black base coat and have patches of white all over there body which resembles a cow. The patches on a Black Parti sometimes fade out into a gray color as they age. Some Partis have a solid color on their backs, that is why some breeders call them blanket partis. This term has nothing to do with genetics it is just a term used because it looks like someone covered there backs with a blanket. 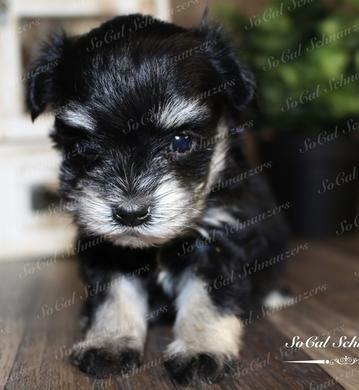 Hints the name "Blanket Parti," they are still registered as a Black Parti.Their markings are always different on every puppy. They usually have brown eyes, black pads, and a black nose. Black & Silver Parti's possess a Black base coat and have patches of white all over there body which resembles a cow. Black & Silver Parti's are just the same as a black parti but have white eyebrows, white chest and white beard just like a Black & Silver would have. The spots on a Black & Silver Parti sometimes fade out into a gray color as they age. Their Markings are always different on every puppy. They usually have brown eyes, black pads, and a black nose. Liver Parti's possess a Liver base coat and have patches of white all over there body which resembles a cow. The spots on a Liver Parti sometimes fade out into a liver pepper color as adults. Some Partis have a solid color on their backs, that is why some breeders call them blanket partis. This term has nothing to do with genetics it is just a term used because it looks like someone covered there backs with a blanket. Hints the name "Blanket Parti," they are still registered as a Liver Parti. Their Markings are always different on every puppy. They usually have brown, hazel, or green eyes, brown pads, and a brown nose. Liver Pepper Parti's possess a Liver Pepper base coat and have patches of white all over there body which resembles a cow. The spots on a Liver Pepper Parti sometimes fade out into a light liver pepper color as they age. The Markings are always different on every puppy. They usually have brown, hazel, or green eyes, brown pads, and a brown nose. and so on depending on the color. Born in many different colors just like a regular parti does except where the white is, whatever color the dog's spots are will start growing in with white hair making it look smoky. It's gorgeous; this is also a more rare marking. One thing you need to know is that Ticked Parti markings change drastically over time. The Markings are always different on every puppy. They usually have brown, hazel, or green eyes, brown or black pads, and a brown or black nose depending on the color of the dog. 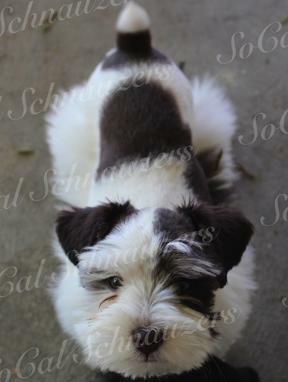 Parti Merles are just the same as Blue, Black & Silver, Liver, Liver & Tan, Liver Pepper, Salt & Pepper, Platinum silver and Wheaten Merles except they have patches/spots of the merle marking on their body. 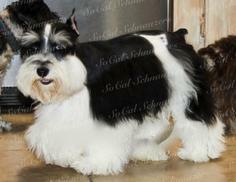 Merle Parti can be a combination of any color above with White that goes over the top line of the dog. Usually they will have mostly White legs too. Eye and nose color will follow suite of the dogs base color. If they are Blue, Salt& Pepper, Black & Silver, or Silver Parti Merle they usually will have black pads, brown, or blue eyes, and a black nose. If they are Liver, Liver Pepper or Liver & Tan Parti Merles, then they will have brown pads, brown, hazel, green, or blue eyes, and a brown nose. My merles are registered through APRI as their color. A Blue Merles base coat color is black with diluted colored areas all over there body. Blue Merles usually have black pads, brown, or blue eyes, and a black nose. They come in many shades. But you will never see banded shades together if it is pure. The Black spots will not have peppered hair in them at all. 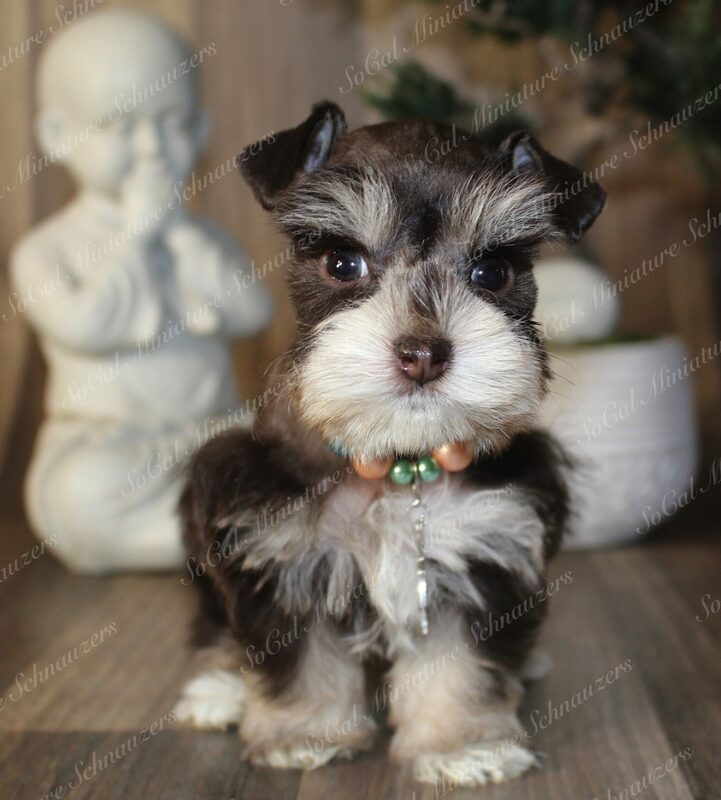 This Photo is From Another Breeder, This Is Not My Dog. A Black & Silver Merles base coat color is black with diluted colored areas on the body. 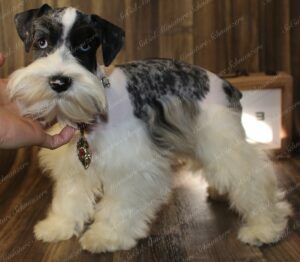 It is the same as the blue merle, but it has white eyebrows, white chest and white under the tail just like a black and silver Schnauzer. Black & Silver Merles usually have black pads, brown, or blue eyes, and a black nose. The Black spots will not have peppered hair in them at all. This color Merles base coat is Salt & Pepper with diluted gray colored areas all over there body. 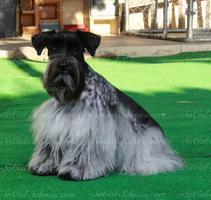 Salt N Pepper Merle is the same as a true Salt N Pepper Schnauzer, banded shades of gray with Black Spots. As in original Schnauzers, the shades of your peppering can vary. Some Salt N Pepper's can have smuttiness in the eyebrows and beards. 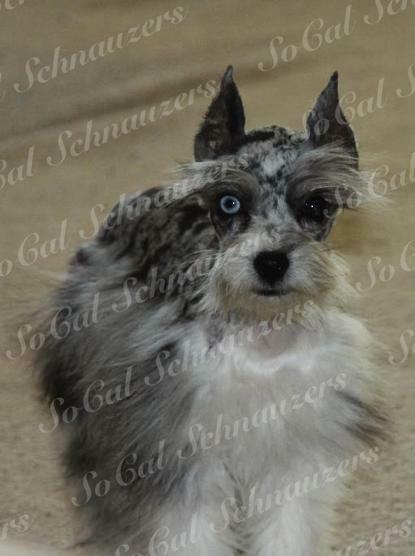 Some breeders are calling their dogs Salt N Pepper Merles when in fact they are Blue Merle. To know the difference, look for the banded hair. 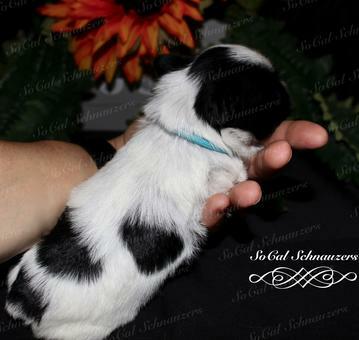 They usually will have black pads, brown, or blue eyes, and a black nose. A Liver Pepper Merles base coat color is Liver with a Peppering gene on top, they have diluted colored areas all over the body. Just like in original Schnauzers, the shades of your peppering can vary. Some Liver Pepper's can have smuttiness in the eyebrows and beards. Your dark spots can also be peppered. 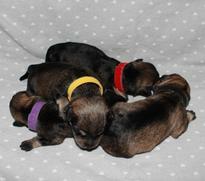 Some breeders are calling their dogs (Liver, Chocolate or Brown) Merles when in fact they are Liver Pepper Merles. To know the difference look for the banded hair.They usually have brown pads, brown, hazel, green, or blue eyes, and a brown nose. A Liver Merles base color is Liver (brown) with diluted colored areas all over their body. Liver Merles are the primary color of a brown cream color with true Liver (Brown) spots. The Liver spots will not have peppered hair in them at all. They usually have brown pads, brown, hazel, green, or blue eyes, and a brown nose. A Liver & Tan Merle base coat color is Liver & Tan with diluted colored areas on the body. 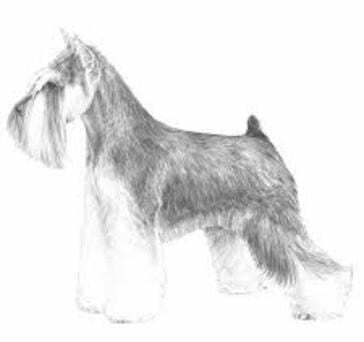 It is the same same as a Liver Merle except it has tan eyebrows, tan beard and, tan under the tail just like a regular Liver & Tan Schnauzer. Some Liver & Tans can have smuttiness in the eyebrows and beards. The Liver spots will not have peppered hair in them at all. They usually have brown pads, brown, hazel, green, or blue eyes, and a brown nose. These Photos Are From Another Breeder, These Are Not My Dogs. Are Merles Pure Bred Dogs? I cannot attest to everyone else's dogs but mine in fact are. I have Daisy, Rose & Duke as well who are all purebred and I have breed certificates on them all to prove this through embark vet. If you would like to see them please ask I would be more than happy to send them to you.They test over 200,000 different genetic markers that can go back as far as 5-6 generations. Yes, some are registered with AKC but the majority are MSCA, APRI, or CKC registered. Registration is just a piece of paper stating the dog is a purebred. It does not matter with what registry it comes from as long as the dog is in fact papered. Are Merles Healthy? / Do They Shed? Please look up Cora, Rose, Duke & Daisy's full DNA genetic vet report done on both of my merles. They have been tested for over 168 different hereditary issues that can be passed down to puppies and not a single one is affected by any issue, not even a carrier. So all this bad talk on merles is not even true, its all made up. Words are words but evidence or proof is far more valuable!! 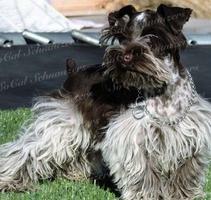 Merles ARE healthy and are just the SAME as any other Schnauzer. I own a few, and I see nothing different about them at all, and NO they DO NOT shed. Is It True That They Have Problems with Blindness & Deafness? No absolutely not or we would not keep breeding them neither would any other responsible breeder. 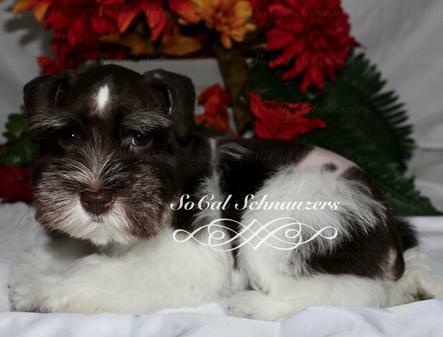 What had happened was, when merle Schnauzers first came about some breeders bred Merles to Merles, and that is bad. If people did a little research, they would find out that in just about every breed of dog that has merle coat colors, that breeding Merle to Merle is a MAJOR no-no. If you breed Merle to Merle 1 in every four puppies is born with blindness or deafness. So its simple, we NEVER breed Merle to Merle. So, therefore, there is NEVER any health issues. If you would like to see for yourself, you are more than welcome to come here. Just give us a call, and we can schedule a day for you to come. What Colors Do Merles Come In?